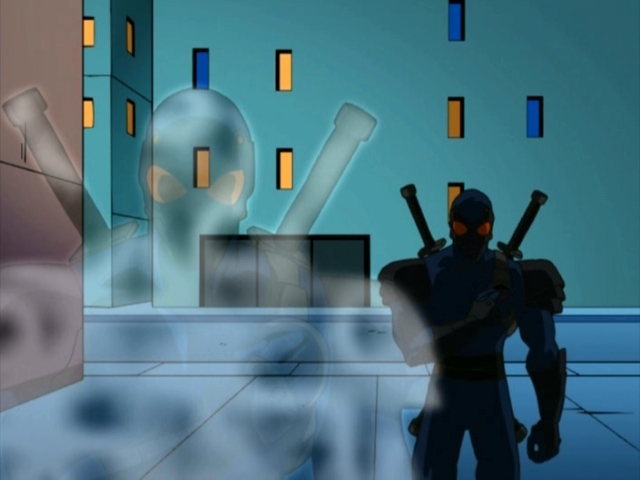 The Foot Tech Ninjas first appear in the episode, ‘The Way of Invisibility’ as Baxter Stockman’s newest invention for Oroku Sakito capture the “green skinned ninjas”. The technology Stockman is able to study from the strange armor piece allows the Foot Tech Ninjas to turn invisible, as well as enhance their physical capabilities. Saki orders Baxter to have the Foot Tech Ninjas bring him the creatures. While Casey Jones and Raphael are our patrolling, they notice a group of Purple Dragons spray painting anti-Turtle graffiti. As they fight them, one thug escapes long enough to call and alert the Foot Tech Ninjas that a Turtle is there. The Foot Tech Ninjas ultimately defeat Raph and Casey. One of them drags Raphael away while the other one hands over Casey to the group of Purple Dragons. neak up behind him ready to attack.Donatello and Leonardointercept them however, using “TurtleVision” goggles. AsMikey and Casey join the fight, Don tells them that the cloaking device is around the chest area. Thinking they had won, the Turtles didn’t a notice another Foot Tech Ninja holding Casey over a whirlpool. The Foot Tech Ninja tells the Turtles to surrender. Leo, Don, and Raph comply and drop their weapons. They then notice Mikey sneaking above the Foot Tech Ninja holding Casey and he proceeds to kick him. The Foot Tech Ninja falls into the whirlpool as Casey is saved by Don. The guys easily defeat the rest of the ninjas and send them into the whirlpool along with their comrade. Later, the Foot Tech Ninja squad is seen battered in front of a very angry Saki. Two of them drag out Stockman for another punishment, despite him being their creator. In The Shredder Strikes Back, Part 1, the Foot Tech Ninjas appear again engaging in battle with Leonardo. They gain the upperhand by turning invisible, but are ultimately defeated when Leo covers his eyes to heighten his other senses. A few more of them are seen later as Hun’s back-up when he takes on Leo himself. In Return to New York, Part 1, they are sent by Hun to find the Turtles who have infiltrated Oroku Saki’s tower. While following the Turtles in the Foot weapons hangar, Splinter senses their presence. Their invisibility gains them the advantage over the Turtles for most of the battle. However, Leonardo explodes a pair of fire extinguishers and they become visible. Donatello then uses a few shocking-shuriken to destroy their cloaking devices. In Exodus, Part 1, some Foot Tech Ninjas ambush Donatello and Leatherhead under Saki’s mansion but are ultimately taken out by Leatherhead. When Karai became the new Shredder, the Foot Tech Ninja wore new garments. They first appeared in the episode Scion of the Shredder where they help Karai attack the Turtles lair. In New World Order, Part 1 they try to attack the Tengu Shredder with Dr. Chaplins mystic weaponry but are defeated by his magic. They appear in the 2003 video game and Teenage Mutant Ninja Turtles 2: Battle Nexus, and are playable in TMNT: Mutant Melee. The Foot Tech Ninja toy was released in 2003. The Mini-Mutants Don vs. Foot Tech was released in 2007. In the 2003 cartoon, they carry two swords on their back. In the 2003 game, the Scabbards are on their back, but the swords are not in them. A Foot Tech Ninja is a playable character in the video game TMNT: Mutant Melee, voiced by Jason Anthony Griffith. The Foot Tech Ninjas do not appear in Fast Forward, Back to the Sewer, or Turtles Forever.